Tap the Send E-Mail link. You have several choices from the resulting pop-up screen. You can send it as a PDF, but then you cannot edit it anymore. Of course, if that’s what you want, then send it as a PDF by tapping that choice. Otherwise tap Original to send it as a Word document. Choose the E-mail option you want to use to send the file. Type in the contact or e-mail address. 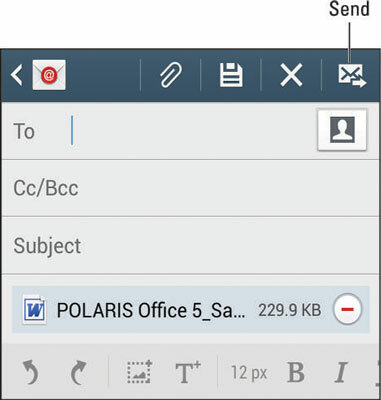 This brings up a blank e-mail screen with your document automatically included as an attachment. 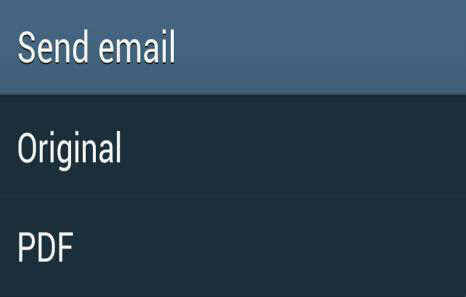 Populate the To text box with an e-mail address (probably from your contact list) and add a subject and a message if you want. The miracle of wireless communication zips the document off to the intended recipient. If you want the document on your PC, simply address it to yourself. The process is the same for Word-, Excel-, and PowerPoint-formatted documents. The formatting of the document on your phone might not be exactly the same as it is when it reappears on your PC. Save yourself time and don’t try to format a document on your Galaxy S 5 phone. Instead recognize that you will have to do formatting on your PC.